Because we were staying largely in accommodation along the West Highland way we were able to take advantage of the excellent baggage transfer service travel-lite, they picked our bags up at the B&B in Arrochar and deposited them at each place all along the route, and because we were doing only part of the route it was the bargain price of £30. We had a wee detour to stay at the Monachyl Mhor hotel, as it was a very special occasion, which gave me the opportunity to do a couple of munros I hadn’t yet done (Beinn Tulaichean and Cruach Ardrain). 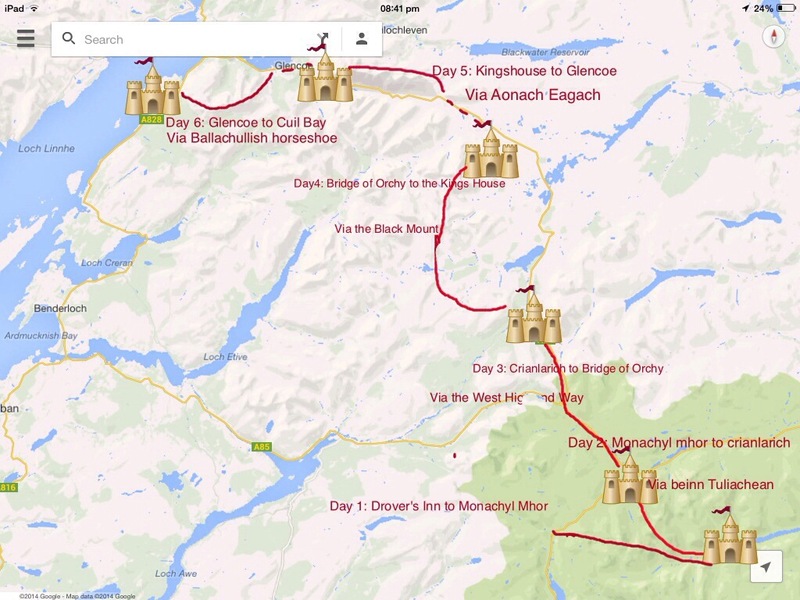 You could do a more conventional route from Arrochar to Crianlarich without the bog trot on day one over the pass from the Drovers Inn at Inverarnan. I would highly recommend the route.All the logistics can be found in my original blog post on the subject. Good Luck! This entry was posted in The West High-mountain Way by nager. Bookmark the permalink.